SuperVision and Instructional Leadership 9 Edition Note: This is the bound book only and does not include access to the Enhanced Pearson eText. To order the Enhanced Pearson eText packaged with a bound book, use ISBN 0133388506. 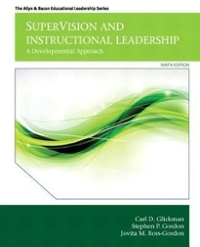 This leading text's emphasis on school culture, teachers as adult learners, developmental leadership, democratic education, and collegial supervision has helped redefine the meaning of supervision and instructional leadership for both scholars and practitioners. The Ninth Edition maintains its comprehensive approach to supervision and instructional leadership and presents new and engaging material throughout. Chapters on knowledge, interpersonal skills, technical skills, technical tasks, and cultural tasks for successful supervision and instructional leadership are included, and the authors emphasize the importance of collegiality, understanding adult learning and development, reflective inquiry, democracy, addressing diversity, the change process, and community building. This is a resource that students purchase, use in class, and reference throughout their careers as educational leaders. The Enhanced Pearson eText features embedded video. Improve mastery and retention with the Enhanced Pearson eText* The Enhanced Pearson eText provides a rich, interactive learning environment designed to improve student mastery of content. The Enhanced Pearson eText is: Engaging. The new interactive, multimedia learning features were developed by the authors and other subject-matter experts to deepen and enrich the learning experience. Convenient. Enjoy instant online access from your computer or download the Pearson eText App to read on or offline on your iPad® and Android® tablet. * Affordable. The Enhanced Pearson eText may be purchased stand-alone or with a loose-leaf version of the text for 40-65% less than a print bound book. * The Enhanced eText features are only available in the Pearson eText format. They are not available in third-party eTexts or downloads. *The Pearson eText App is available on Google Play and in the App Store. It requires Android OS 3.1-4, a 7” or 10” tablet, or iPad iOS 5.0 or later.